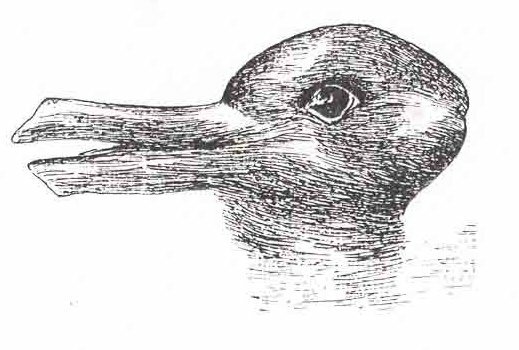 As you might know, I am a fan of bi-stable images like the famous duck-rabbit illusion….. 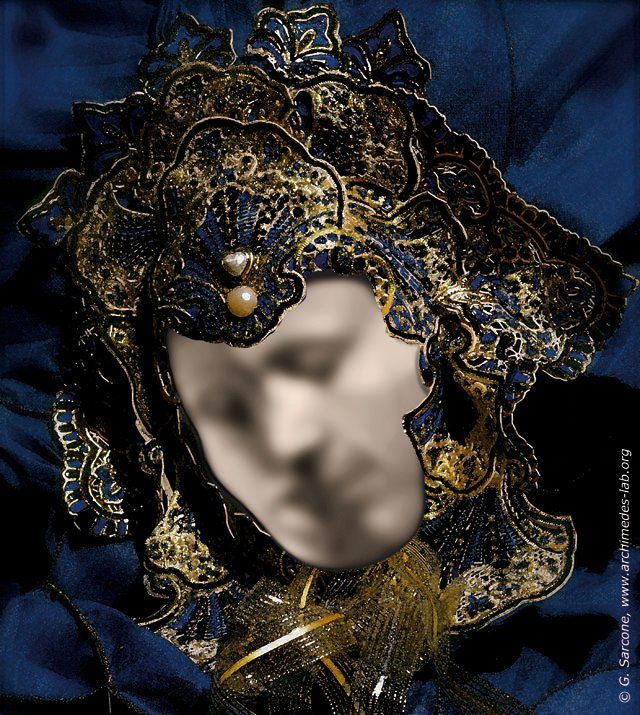 Imagine my delight then, when one of the top ten entries for the 2011 Best Illusion of the Year competition (here) involved a wonderful bi-stable image of a face/two lovers kissing, by Gianni Sarcone, Courtney Smith & Marie-Jo Waeber from the Archimedes Lab Project in Italy. Here it is…. Wow. Really good. Love the blog. I’d been wanting to find something exactly like this for a long time! Took a couple of minutes and then, wow. Great image, slow to figure but then awesome. I have seen this before and I can always initially see a couple kissing and then see one face, really struggle to see the couple after. First time I’ve seen it, and I was the other way around – single face first, hard to find the two, and then, once found, hard to see the single face again. Scanning the page before reading, all I saw was a fuzzy mirror reflecting one face. Upon reading the text, now I can’t stop seeing the couple kissing! Awesome. I’m the opposite of Nick. First I saw the face, then the lovers. Now I have trouble seeing the face. Wow, it was really hard seeing the two lovers kissing. It took a long minute. Really awesome. If people are having trouble, the mouth is also the mouths of both lovers going in for the kiss and each eye is also an eye from each lover in profile. Wow! Thanks for the heads up. I couldn’t see anything but a face… This is really cool. I do wish though, Richard, that when you introduce these you don’t give away what’s in the pic until after the pic. When the illusion is a “this or that” kind of thing, I think it almost feels like you’ve been given the answers. I like to scan the pic thinking “I can see a face, sure, but what is the other thing? Am I looking for a cow? Or a map of the world??? Definitely took a while to see. Very impressive! Fabulous. Like Frank, I also saw the face first and it took awhile to see the lovers. Then I had to squint to bring the face back. I love these types of images as well. I always see the duck first, before the rabbit. As for the second, it was the face I saw before I readjusted and saw the two lovers kissing image. Terrific! After quite a while I could just make out the 2 lovers (from mjr256’s hint above) but it is only a fleeting image and returns to the single face. I really have to concentrate to see the 2 lovers. It’s not stable. Reverts back to the single face, which is all I could see in the beginning. I’ve not seen this one before, and it took me a little while to see the two lovers kissing. how could i see the lovers? I actually find the two lovers more stable. I have to concentrate to see the face again. Most seem to see the face first, for me the lovers were instant then I’ve really struggled to see the face, the face doesn’t seem very good. _Finally_ saw the lovers, thanks to mjr’s tip above – the face is just too stable for me. I keep seeing the blue trim as an elaborate headdress, which doesn’t help. I can force myself to see the lovers after reading the hint in one of the comments, but the face reasserts itself as soon as I stop concentrating. As someone else said, the fabric just looks like a headdress around a face to me. Been looking at it for ages and still can’t see the single face. The two lovers were there instantly for me and I don’t see how the single face could appear to anybody as the mouths and noses are clearly separate. Very clever. I’m with those who saw one face first then the pair then had trouble not seeing double. The fuzzy centre with a pin-sharp surround adds to the illusion by giving it depth. I started out seeing the face, then shifted to the lovers. Hard to shift back at first, but looking at the image peripherally (so basically, focusing your eyes next to the face/lovers area) makes it easy to shift at will. Although the lovers do remain the stronger image, especially looking at the eyes. Very beautiful and romantic. I think it’s pretty artistic. they’re not really kissing are they, it’s more of the guy’s profile hiding the girls face…or am i seeing something different? Excellent illusion! Saw the face first, then the twosome. Can switch back and forth at will. Nice! And on that note, Richard, it was a very pleasant surprise to see you perform at Uncaged Monkeys at the Hammersmith Apollo last night. Your joke about the rabbit/duck, which I won’t give away, was one of the best of the evening, I thought. I saw the duck first before the rabbit but the second i saw the face first took me a minute to see the lovers kissing?! Wow! That took me a while to see. I purposely avoided reading the description at first because I wanted it to be more surprising! Very nice Illusion. the face was very clear and the lovers took a short time to perceive – I think it is a matter of depth on perceiving each option – the face (imho much less detailed than the lovers) is surface (you can get it by squinting as someone said already) but the lovers are deep! i wonder if it would be interesting to know who is right and left handed and if it links to their immediate perception and also the subsequent dominant one. Is there a way to judge a degree of left – ambidextrous – right handed ness? BTW I am right handed but can do a few things ok left handed and have left handedness in my family. Duck Rabbit makes good beer! I could only see the face on my iphone, but immediately saw both images when I looked on my PC. Maybe the bigger screen helps. I see a duck if I look at the left of the image, and a rabbit if I look at the right side of the image. Looking at the center it’s mostly duck, but it changes to rabbit occasionally. On the other picture I see one person if I look at the eyes, and two people kissing if I look at the mouth. I can make the images change at will too, but it’s easier if I look at the specific section of the image where one of the images is stronger. A left side of a face and a right side of a face look like a whole face when put together? I am amazed! I saw the Lovers then the face. Next Can you solve the mystery of the balloons?